An Irishman who was freed after spending more than four years in an Egyptian prison has said it "feels like a dream" to return home to Dublin. Ibrahim Halawa was 17 years old when he was arrested during a siege at the Al-Fath mosque in Cairo in August 2013. Now 21, he was acquitted of all charges last month but his release from prison was delayed until last week. 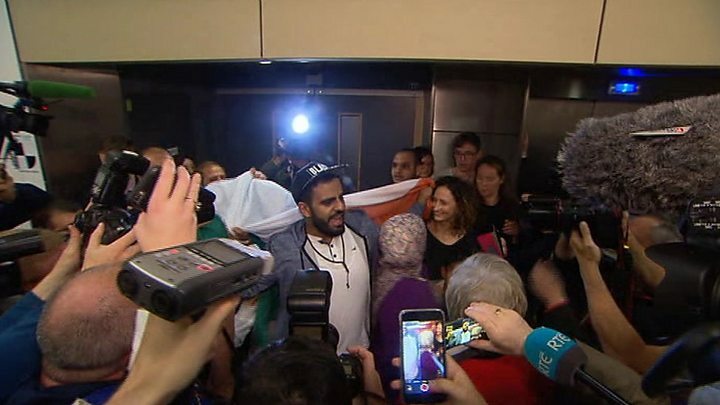 After his flight from Cairo landed in Dublin on Tuesday he said: "This is the moment I've waited for for four years." Mr Halawa and 500 others, including his three older sisters, were accused of inciting violence, riot and sabotage after their arrest. His sisters were allowed to return home to Ireland within three months, but he remained imprisoned and his family led a lengthy campaign for his release. Mr Halawa was released and reunited with some of his family last Thursday after being acquitted of all of the charges against him. "I want to thank the president; I want to thank the Irish government for working so hard; I want to thank the Irish people... thank you all for your support - it means a lot to me," he said at Dublin Airport. "I'm a free man, acquitted after four years. "I've left a lot of cellmates behind - there's still a lot of innocent people behind bars around the world." He said he would be "taking some time off" and would need medical checks. "My mum is sick, so I need to stay by her side and we need to get some family time as well," he added. "I need to get my life straightened and go back to college and get my career done." Irish Foreign Affairs Minister Simon Coveney told Irish national broadcaster RTÉ that it was a happy day for Mr Halawa and his family. "I and all of my colleagues in government are very pleased that Ibrahim's ordeal is now at an end, and that he is back home with his family," he added. "There will be many challenges for Ibrahim as he comes to terms with all that he has been through, and all the changes that have taken place while he has been detained in Egypt. "He will need time and space in the period ahead and I hope that his privacy and that of his family will be respected." Last week, the family's lawyer Darragh Mackin said Mr Halawa had spent four years of his life "in the most difficult and cruel conditions". Mr Halawa protested against his detention with a series of hunger strikes, and at one stage his family said he became so weak he was using a wheelchair.